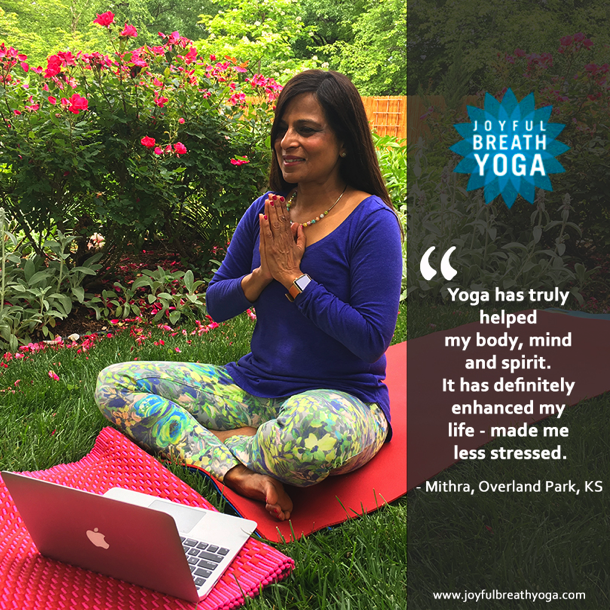 Our Member Spotlight of this month is Mithra Amaran has been a dedicated JoyfulBreathYoga member since the very beginning in 2012, and she would like to share her Yoga inspiration path with all of us, hoping maybe she can encourage more people to change their lives for good. Online yoga can be practiced with co-workers or family or alone at a convenient time for you with your yoga teacher. However studio yoga makes it possible for your poses to be corrected by your teacher so that you can confidently do online yoga on your own by just following your teacher. In order to gain confidence in your yoga practice, as well as, to get more flexible, you have to practice yoga every single day. Even if it is only for 5-10 minutes. Online yoga makes that possible.